After launching the OPPO Find X and two upcoming mid-range smartphones—OPPO F9 and OPPO F9 Pro—the Chinese smartphone brand will soon launch a newer, lower mid-range smartphone. Dubbed OPPO AX5, the device feature a large-capacity battery and a dual-camera setup at the rear. We had already leaked the complete specifications list of the OPPO F9 a few days ago. OPPO could also release the device as the OPPO R15 Neo based on the market where it is being released. We’ve now received information that reveals complete features and specifications of the smartphone ahead of the official launch. Without any further ado, let’s have a look at the specifications of the phone. The OPPO AX5 will feature a 6.2-inch In-Cell IPS LCD screen with HD+ resolution (1520×720 pixels), 16.7 million colours, and 10-point capacitive multi-touch. At the rear, the phone will feature a 13MP+2MP dual-camera setup with autofocus and LED flash. The primary sensor will feature f/2.2 aperture, while the secondary sensor will feature f/2.4 aperture. At the front, the OPPO AX5 will have an 8MP selfie camera with f/2.2 aperture. The phone will feature a large, 4230mAh battery, which should easily last a day and a half with normal usage. The OPPO AX5 will run Android 8.1 Oreo based ColorOS 5.1 interface, and it will be equipped with a Qualcomm Snapdragon 450 processor. The chipset features a 1.8GHz octa-core Cortex-A53 CPU and Adreno 506 GPU clocked at 600MHz. The phone will be available in two memory configuration variants: 3GB RAM+64GB storage and 4GB RAM+64GB storage. The phone will be available in Diamond Blue and Diamond Pink colour variants. It will measure 156.2×75.6×8.2mm and weigh 168g. The company will also bundle a screen protector and a case with the box. The OPPO AX5 will be released with a dual-SIM card slot, and will be compatible with most 4G LTE networks. Other connectivity features on the phone would include GPS/A-GPS, GLONASS, dual-band Wi-Fi a/b/g/n, Wi-Fi Direct, Bluetooth 4.2, a microUSB 2.0 port, and a 3.5mm headphone jack. It will also come with most of the necessary sensors, including the accelerometer, ambient light sensor, compass, g-sensor, and a proximity sensor. Since there’s no mention of a fingerprint reader, we think that it will feature the Face Unlock mechanism, something that’s being used in many recently released smartphones. OPPO AX5/R15 Neo: Expected Price Range? 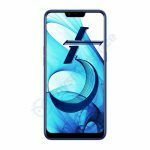 Going by the specifications and OPPO’s previous launches and their pricing, the OPPO AX5/R15 Neo will most probably be released with a price tag that’s lower than the price tag of the OPPO F9 and the OPPO F9 Pro. If this smartphone ends up being launched in India, the OPPO AX5/R15 Neo, could be priced below the Rs. 20,000 mark. 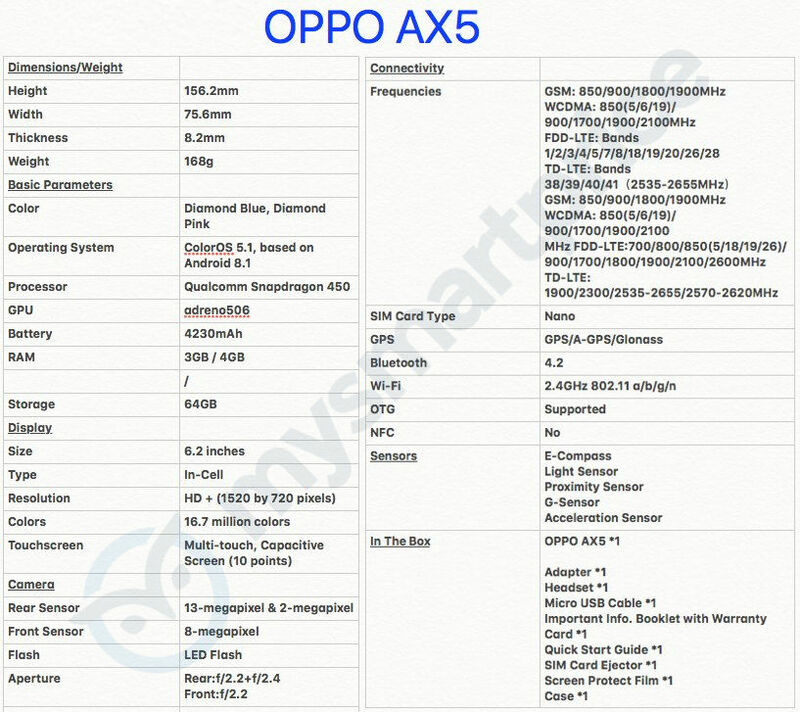 OPPO AX5s Key Specifications Revealed Through Bluetooth SIG Certification, Launch Imminent?